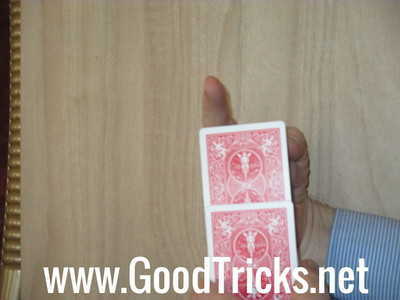 An amazingly convincing levitating card trick in which a spectators freely chosen card is first shuffled into the deck and then made to rise out of the middle of the deck by itself. 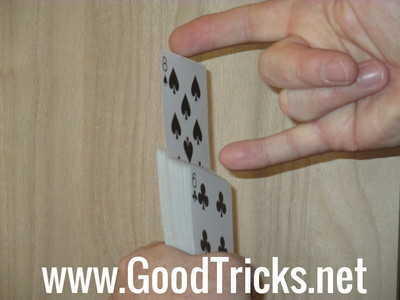 This super card levitation magic trick uses no gimmicks and requires only a pack of playing cards. 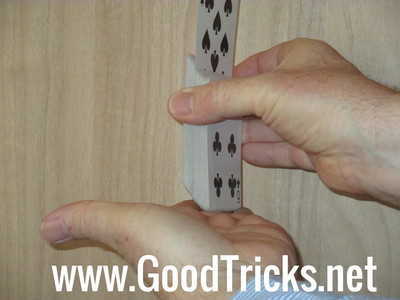 This is great example of close up magic and is a favorite trick of a lot of good table magicians. This page contains step by step photos and an instructional video. Performance : The deck is first shuffled ( It can even be a borrowed deck ) and then fanned out in front of the spectator who is allowed to choose any card, memorize it and then hand it back to be further shuffled into the pack. The pack is then held out directly in front of the spectator where their chosen card is seen to be slowly rising out from the middle of the deck. This looks amazing and will leave your audience baffled as to how they viewed a levitating card right under their nose. Your spectator is presented with a fanned out deck. They have a free choice of card which they memorize and place back face down into the middle of the deck. You now need to secretely control their card to the bottom of the deck. There's many methods of doing this. 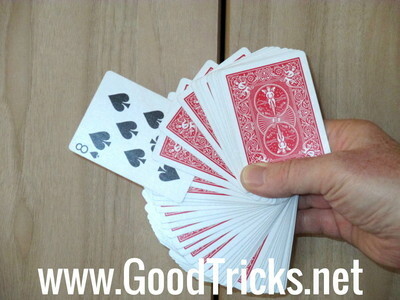 One method using an overhand shuffle is shown in magic video lower down this page. Now hold the deck so that the back of the pack is directly facing the spectator. Now, announce that you will use your first finger to levitate their card out of the deck. Ensure that you have a slant at top of the deck as shown in photo. Hold first finger one inch above deck and lift it up slightly. Secretly push little finger into deck and use this to slide up the card. As spectator's card is slid up to top of deck you should now be able push it into slanted top edge of deck. 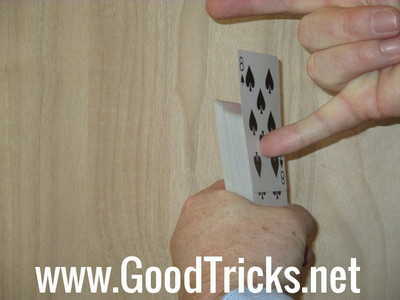 When it is near the middle of deck push down on the card with your first finger so it is wedged firmly in the pack. As you now turn the pack round to show your spectator that their card is actually in the middle of the deck, use your other hand to push up the deck from underneath it. This will level up the cards so that the slant is no longer visible making the trick even more believable. This shows the stunt being performed from the spectator's viewpoint. Practice the trick in a mirror so that you are sure that your little finger is hidden from their view. Watch the magic video, above to see the performance and secret sleight of hand required to get the best effect from this clever magic showing a levitating card. The pay off is the satisfaction that you get by watching your audience's look of astonishment. 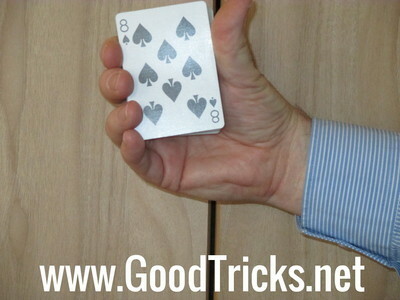 Tips : This street magic style rising card trick gets a good response but can be greatly improved by an entertaining performance and chat by the magician. Practicing the timing and smoothness of the card moving up from the deck should pay dividends by enabling you to present a polished performance. If you like the idea of levitating magic, you may wish to check out our How to Levitate Small Objects page.